2018 was marked by a severe drought in Iraq, a country formerly rich in water. The effects of climate change are visible with lower rainfall than in previous years and a steep increase in temperatures. But all crises are complex with many origins, and climate change only worsens a latent plight. 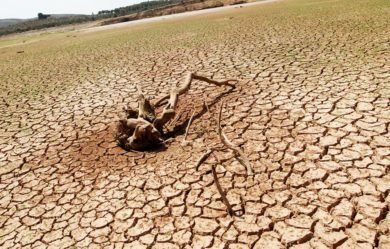 Political instability, conflicts and the unfair distribution of water resources in the region have long set the stage for almost permanent water shortages. A new war, that for water, is looming. The situation is worst in southern Iraq, in the province of Al-Basra. Oil and farming are the mainstays of the region. An increasing number of farmers are leaving their lands to go to the province of Bassora and cram the shantytowns. According to the World Bank, the share of agriculture has slumped with the proportion of people employed in farming in Iraq falling from 43 to 26% between 1991 and now. The reason: the rarefaction of water, which reached a peak in the summer of 2018. The Tigris and the Euphrates, the two large rivers that have irrigated Mesopotamia down to the Persian Gulf for thousands of years, have reached their lowest levels. Saltwater infiltration has started in the Chatt-el-Arab canal, at the confluence, making the water unfit for consumption, devastating fish life and cattle and depleting the crops. In certain areas, water salt levels are twenty times higher than average, leading to fears of a new exodus. Social tensions have emerged in the city of Bassora, sparked by this economic and health crisis. Demonstrations against government inaction and poverty have been organised. The crisis is deep-seated: Iraq needs 50 billion cubic metres of water a year to satisfy its agricultural, domestic and industrial requirements, in comparison to the current volume of 30 billion m3. This water comes almost exclusively from rivers, whether for farming, industry or households. Agriculture, which uses 80% of Iraq’s water, is the activity most affected. Only a third of the country’s arable land can be exploited. On top of everything, in addition to the rarefaction of water, the crucial issue is how it is shared between Middle Eastern countries. Iraq suffers from its geographical position, downstream of its neighbours, Turkey, Iran and Syria, and the absence of cooperation with them regarding the cross-border management of the Tigris and the Euphrates. Since the 1960s, the dams built upstream on the Tigris and the Euphrates – in Turkey, Syria and Iran –have had impacts on Iraq’s water resources. The project with the biggest impact is that of Turkey, with the “Southeast Anatolia Project” launched in 1980 and intended not only to sustain national economic growth but to underpin Turkey’s regional political dominance. It is characterised by the construction of 19 hydropower plants and 22 dams along the Tigris and the Euphrates. At present, not all the works have been completed but Turkey is in a clear position of strength, as it controls the sources and refuses any agreement on the fair distribution of water. The main sticking point between the countries is a legal one: Ankara gives the rivers only a cross-border status rather than an international one, contrary to the two neighbouring countries. Resource sharing will remain difficult to establish without a clear and common legal status. Other difficulties intrinsic to Iraq must be added to this dependence on Turkey: years of war have heavily damaged the country’s hydraulic infrastructures and they have not been maintained or modernised since, due to the embargo. Successive governments have failed to implement a genuine hydraulic development policy. 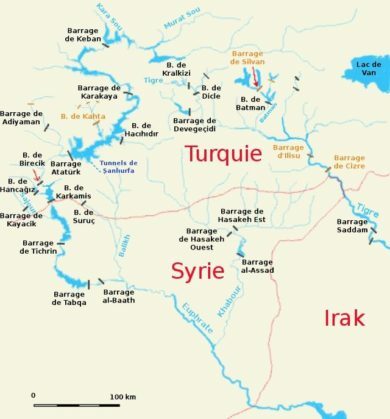 The shortage of water therefore risks exacerbating tensions between Iraq and Turkey, in particular regarding the construction of the new dam of Ilisu on the Tigris. This project is also subject to strong opposition in Turkey itself, as it threatens to submerge the historic town of Hasankeyf. The shortage of water also risks increasing tension between rural and urban populations, with the displacement of thousands of people living on the river banks. Hello, I invite you to visit the following page, on the Initiatives for the Future of Great Rivers (IFGR) website :A water crisis gives rise for concern in Iraq https://www.initiativesrivers.org/actualites/a-water-crisis-gives-rise-for-concern-in-iraq/ Best regards.